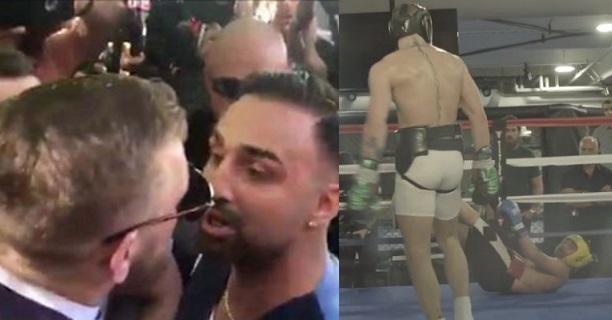 Following a number of reports, former two-weight champion Paulie Malignaggi has dismissed claims that he is in negotiations for a fight with Irish MMA superstar Conor McGregor. The past 48 hours have seen numerous outlets pick up on a tweet from @BoxingKingdom14 which, citing a ‘credible source’, stated that negotiations were ongoing between the pair. This was followed up by a similar claim from MMA insider #Dizz©. I’m hearing that @PaulMalignaggi vs @TheNotoriousMMA boxing match is in light discussions. This is most likely Conor and Paul’s Best chance for a long awaited grudge match, and for both to make a little bit more extra cheddar. Like discussions for now. Nothing serious. Malignaggi, though, has quashed these rumours. The pair share a grudge following their sparring sessions back in 2017 in the lead-up to McGregor’s mega-money bout versus Floyd Mayweather in Las Vegas. The Crumlin light middleweight claims he dropped Malignaggi [36(7)-8(5)], with pictures and then footage of the event being released by UFC boss Dana White. The Italian-American has always stressed that the visit to the canvas was the result of a pushdown and would later be seen in the company of Mayweather where he suggested that he was relaying sparring secrets from his two sessions with McGregor [0-1(1)]. Following the Dubliner’s tenth round stoppage loss to ‘Money May’, Malignaggi, who last fought in March 2017, would propose a St Patrick’s Day fight in New York but this would not materialise. McGregor would instead return to the UFC and was submitted in the fourth round of a lightweight (155lbs) title challenge versus Khabib Nurmagomedov back in October. A rematch with the Russian was said to be McGregor’s first priority but his coach John Kavanagh revealed afterwards that a return to boxing had also been mooted with both Mayweather and Malignaggi being mentioned. Soon after this, Matchroom boss Eddie Hearn stated that he was interested in promoting a fight between McGregor and regular Sky Sports contributor Malignaggi, revealing that he had reached out to the Irishman’s team – however, again, nothing seemingly came from this.